I bet you didn't think it were possible to have a coleslaw without mayonnaise, did you? After you have tried this recipe, I guarantee you will never have regular coleslaw again. 1. Slice grapes in half and coarsely chop avocado. Sprinkle lime juice on avocados to prevent oxidation. 2. Add cabbage, grapes and avocado to a large salad bowl. 3. In a separate bowl, grate garlic clove. 4. Add sour cream, and finely chopped egg to garlic. Mix thoroughly to produce a creamy dressing. 5. Add dressing to cabbage mixture and toss well to coat. Looks and sounds wonderful, only if I can get good ripe avocados in Iowa. creamy avocado? Sign me up! This looks so good, I never thought to mix avocado with coleslaw, what a great idea. 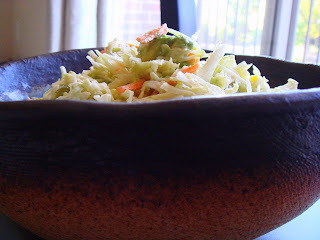 The creamy avocado and the crunchy coleslaw together-yum-I can't wait to make this!